The earliest written references to a pasties lend credence to its origins in Cornwall, England. In an Arthurian romance written for the Countess of Champagne in the mid-1100's, the author, Chretien de Troyes wrote, Next Guivret opened a chest and took out two pasties. 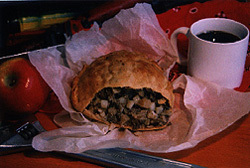 "My friend," said he, "Now try a little of these cold pasties ..."
The setting of the romance was in an area that is today known as Cornwall, England. It is said that the Devil never crossed the Tamar into Cornwall on account of the well-known habit of Cornish women of putting everything into a pasty, and the he was not sufficiently courageous to risk such a fate!